The picture above is of our daughter Carrie when she first visited the Pacific Ocean in the late1970s. I held her hand that day as we played in the ocean, just as my father had held mine in the years before when I was a child and we visited the gulf and played in the surf. I recall the feeling of the swells rolling into the shore lifting me, with the help of my Dad’s strong grip. 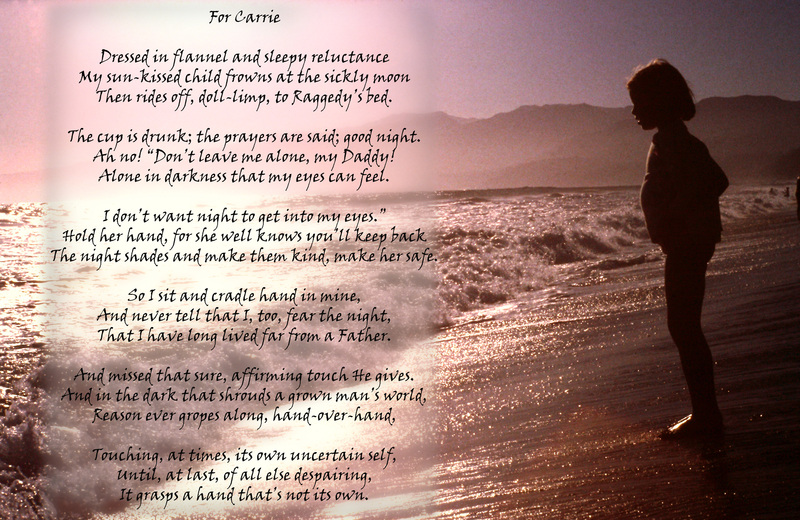 My feet often did not touch the sand beneath the waves, but Dad was always there. I did not choose to swim in the deep end of the sea, but life has cast me there. Many times I have seen the waves and felt their swell and was afraid. It was then that night began to get into my eyes and I reached out and caught hold of a hand not my own. So I persist swimming on without touching the bottom, fearfully at times but hopefully as well, swimming in the deep end of life. My own child taught me this. It is inevitable, I suppose, that one will find favorites among a group of people because of time shared and of things held in common, because of mutual affinities, or because of parental bias. Among my many cousins whom I knew and loved, two were especially close and even today occupy a special place in my heart and imagination: Nelson and Margaret Ann, the children of my Aunt Nell of Dothan, Mother’s closest sister. I always thought it ironic, even before I knew that word, that Nelson was so named, because he was truly “Nell’s son.” Aunt Nell was an “Army widow,” what we called a wife deserted by a husband who seemed to be always serving in distant duty stations. I remember only once meeting Sgt. Henry Jenkins, my uncle. It was 1954, in the middle of the night at the train station in Washington, D.C. My family was relocating for three months to New Jersey where Dad, a master aircraft mechanic, would study jet engine repair at a special school. Uncle Henry arranged for us a midnight tour of the illuminated capital city from the backseat of a Yellow Cab. It was a thrilling even if frenetic experience that I shall never forget; we gawked at the capital, blinding white in the search lights, the Washington Monument streaking into a black sky and Arlington Cemetery with the marble marines raising the flag on an inky Iwo Jima. But I left on our train a few hours later, wondering what the city and my uncle were really like when they emerged from the shadows. On the other hand, I knew quite well what my Aunt Nell and her children were like; they were an extension of home, were family, were people who seemed to love or at least tolerate me with right good humor. I do not remember a time when they were not part of the scenery of my grandparent’s world. There were the summers when my mother brought my brother, my sister and me for a two-week stay “at Nell’s.” When I reflect on those few days out of my life they glow in my imagination as if they were the substance and main part of my young days. They were that significant. 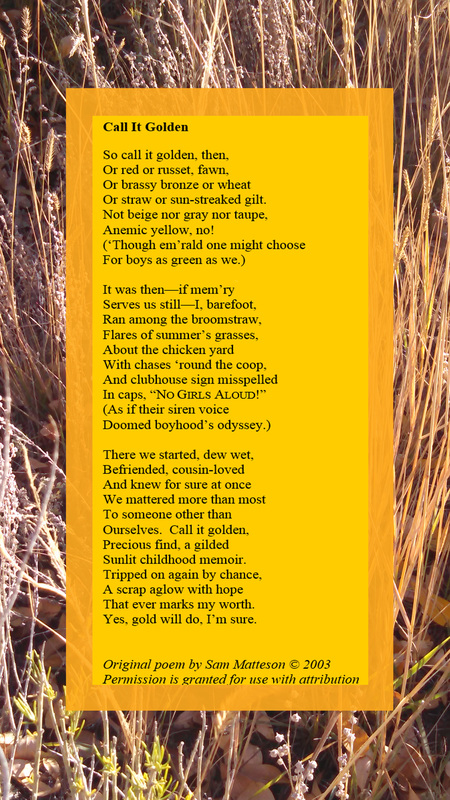 It was then that I ran barefoot among the broomstraw and began to learn something of who I was. There were one hundred chases around the chicken coop that Nelson, Dale and I later made a clubhouse—for boys only. We even painted a rude sign, misspelling in capital letters, “NO GIRLS ALOUD!” We had no worry, actually, of female intrusion, since the place still smelled of chicken excrement and rotting feathers even though the birds had been evicted two years earlier. Margaret Ann and Cindy Lou held their noses whenever they passed the rickety door, whether at the lingering smell or at our preadolescent prejudice, I am not totally sure. It was a time when Dad was again away from home on TDY, a hateful designation but one that was lucrative for the family budget. In letters exchanged between my parents I learned of forgotten misadventures. To her husband, Audrey wrote in a letter dated July 16, 1956, “Our visit in Dothan was nice enough considering the number of children. Nelson and Sammy converted the chicken house to a hut and in the process Sammy learned the facts of life….Sammy expects a birds and bees conversation out of you for I told him Nelson’s ideas might be cockeyed but you’d know the straight of it. To me, the weeks seemed endless and an eye-blink at the same time. The mornings of almost every day were filled with hot hours of blackberry picking in the pastures with four others—brother, sister and cousins. 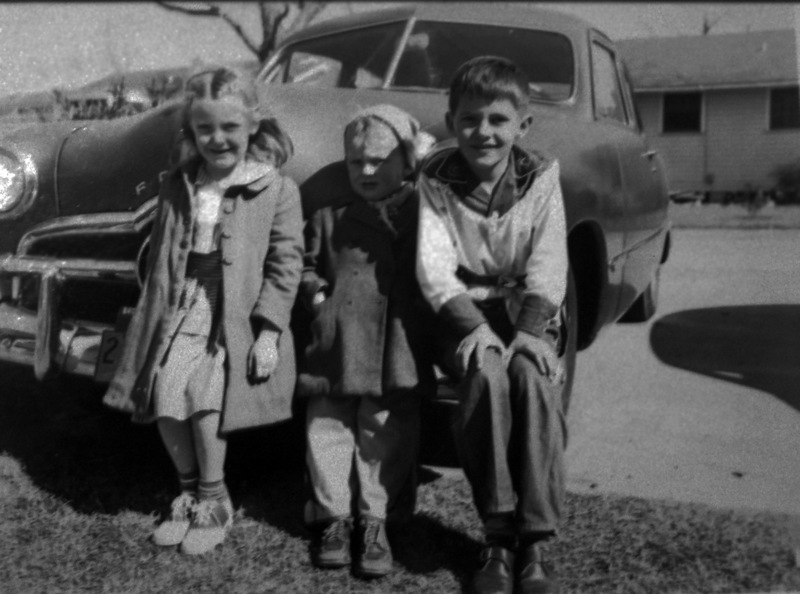 We five, in a running contest, filled buckets with gallons of the black, juicy fruit destined for the jelly pot of my industrious mother and Aunt Nell. I wondered how adults could have such obvious fun doing a monotonous and arduous task like jelly making or canning, but the two women, their heads frequently together, touching, hair in bandanas, laughed and smiled and glowed with more than perspiration as they worked together to mash the berries, strain them through ancient purple-stained tea towels or boil the juice with sugar and pectin, eternally stirring and vigilant lest it burn. I never learned from either the thousands of things they spoke of when the children were out from under foot, but they seemed as if they grew wiser and more peaceful with ever minute they shared. I was the eldest child in my family and was always looked to with expectations of leadership and responsibility. In my cousin Nelson, I had my own interim surrogate older brother of sorts. In many ways I secretly admired his version of adolescent rebellion and his emulation of James Dean. For his part, he tolerated me, I think, even if four years his junior, as only a mild annoyance, sharing, instead, the secret pleasures of country and small-town life. I was convinced that he secretly approved of me because he did not ignore me but rather playfully wrestled with me and tormented me as young pups do. My head became accustomed to its occasional knuckle rub. His was just enough rough housing to make me feel initiated, but not so much as to feel abused or unappreciated. It was he who taught me the clandestine and disobedient joy of riding a footlocker down the mountain of cotton lint that was deposited by the cotton gin on the lot down the road. Mother had—unreasonably I thought—forbidden this exploit for fear that we would suffocate like infants in the slick fluff. It was he who took me “cruising” in his truck when a teenager; he revealed the sights, the smells and the light-hearted breezes of the summer night of the small 1950’s town of Dothan, Alabama; its Main Street, the Diary Freeze, the long country roads, Dothan Senior High. There he attended as had my mother and Nell and Johnny Mac Brown, cowboy film star. All these common sights were exotic and special to my eyes. I took in all he had to say as wise and worldly. I remember to this day his admonition when I reached the bottom of a milkshake. The sound of slurping through the straw he called, “The mating call of the North American Fool.” Now, I sometimes slurp for my own private rebellious delight and sometimes I am politely silent, but I never reach the end of a shake or malt without thinking of Nelson and what he gave me. Margaret Ann was my idea of the perfect bobby-sock teenage girl, complete with poodle skirt and pony tail and Friday night softball games where she arranged for me to sell peanuts to the spectators. She let me listen to her precious collection of 45 rpm vinyl disks and hear the crooning of the heroes and idols of my generation, American Bandstand in her bead and board bedroom accompanied by the rhythmic sawing of summer cicadas outside the screened window. I appreciated her kindness then and her playfulness. What I did not appreciate at the time was her hidden strength of character and spiritual depth that revealed itself as an adult in her ministry to women across the South and her positive spirit and hope in the face of the deaths of a husband and a mother by cancer. But such assets may not be visible at our start. Indeed, who would have guessed her awkward and stuttering cousin, Sammy Gene, would have become a professor who for nearly thirty years daily lectured hundreds of people at the university. In those days of luxurious indolence, I learned how to turn boredom into peaceful reflection and loneness into solitude. When we were sentenced to the sweltering hours of mother-decreed afternoon quiet time, I happened upon the excitement of discovery in Nell’s parlor. The encyclopedia held a deep well of knowledge that I learned I was thirsting for, like a berry-picker in the noon-day sun without a water jug. I randomly looked up a topic, “Argentina,” and there was “Argon” beckoning; preceding “Balloon,” with a picture of Picard ascending, was “ballistic.” On and on. Soon I looked forward to the hours I could read of the wonders of the universe. My cousins shook their heads at their strange relative. “Sammy’s reading the encyclopedia, again.” They must have wondered at this freak of nature that was related to them, secretly fearful that such bookishness was congenital. I did not read all day, however. In the long otherwise empty afternoons we invented our play. I once discovered the ant lions under the house that sat on red brick pillars tall enough to permit you to walk crouching under the floor jousts. The predatory insects made conical pits in the dust there that had lain protected from water for decades. A hapless ant that attempted to traverse the pit would slip hopelessly down into the vertex where she vanished in a flash of sand. If you pushed a little sand into the pit, the thing that lived at the bottom of the inch-deep crater flung a plume of dirt out over the side. I spent hours watching and teaching myself to catch the mysterious tiny monster. A little spittle on a straw and a quick jerk at last brought up a hideous creature the size of a grain of rice with disproportionate claws and mouth. This must be what ants dream of when they have nightmares. I thanked God that I did not daily face such a challenge as I walked about. Cousins are indeed curious characters, but they are more than set decorations in the drama of my memory. They are individuals who loved me even though they did not have to. I shall never see a jar of home-style jelly, the sun shining through it like some cathedral glass rose window, without thinking of the hands that picked the fruit and the labor that transformed the juice into jelly. I shall never cease to feel the glow of those summers. When I review the scenes of those days, I am sure that they are priceless; and on sober appraisal, “golden,” indeed, is what I shall call them ever. In 2003 my wife’s sister and brother-in-law, Linda and Bob Warren, whom I like to call my “bonus siblings,” drove us out from Buena Vista, Colorado in their four-wheel drive vehicle into the dense San Isabel National Forest, and over Cottonwood Pass. 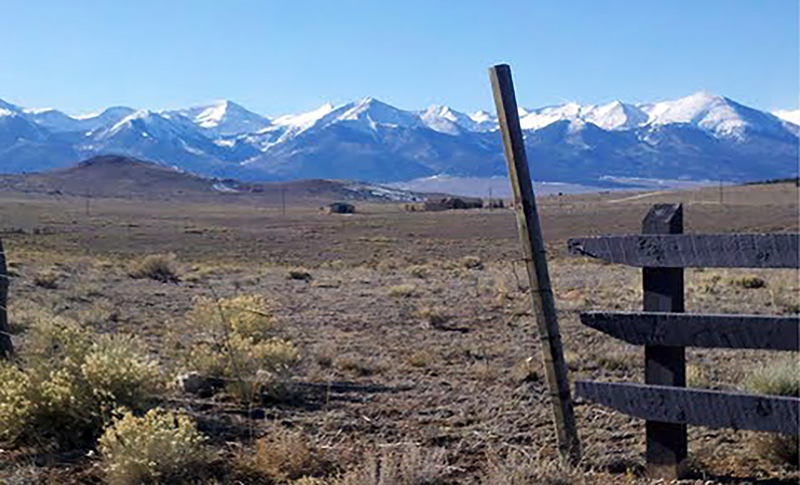 Bob and Linda have resided in the Wet Mountain Valley (pictured above) for over twenty years and should by now become accustomed to the stunning beauty of the mountains and forests of south central Colorado. But not so. They were as enraptured as were Carolyn and I, the visitors from the flatlands. 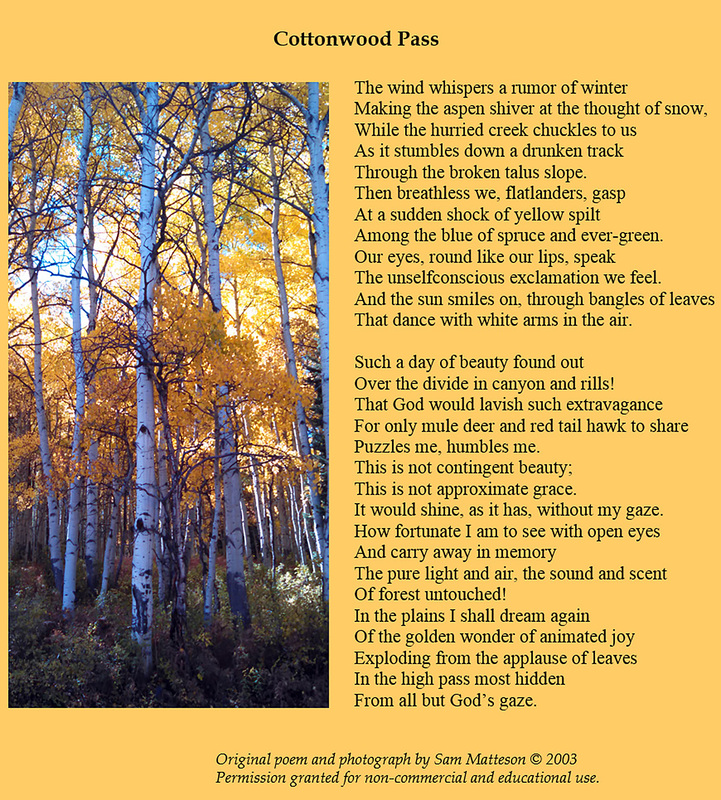 Beholding the autumn foliage in the pass, I was inspired to pen the poem below that not only exalts in the beauty of the place but also marvels at the extravagance of a God who would create such scenes for His own pleasure. What a gift to glimpse it, too, almost incidentally. April has been designated National Poetry Month (http://www.poets.org/national-poetry-month/stanza/national-poetry-month-2015) Below is a poem that expresses my simultaneous aspiration and doubt about my attempts at communicating truth. It was inspired by a dream that is described in the poem. I probably was under the persistent influence of my research into the history of stringed instruments, ancient Grecian music, and better ways to intrigue my students in my musical acoustics class as I went to sleep the night in question. Inspiration can spring from the oddest intersections of thought. One of the oldest complete musical poems is the text of the Song of Seikilos (ca. 200 BC), an ancient Greek text performed by the Atrium Musicae de Madrid directed by Gregorio Paniagua that can be found on-line at https://www.youtube.com/watch?feature=player_detailpage&v=9RjBePQV4xE#t=6. 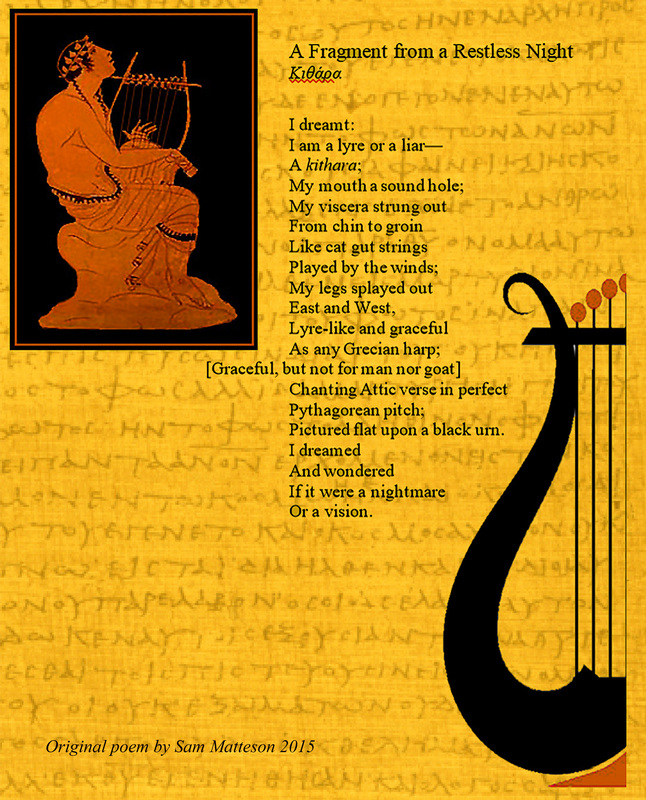 Its haunting text and musical accompaniment on the kithara (lyre) must have made a subconscious impression on me. It may do the same for you. Permission is granted for reposting or copying for educational use.